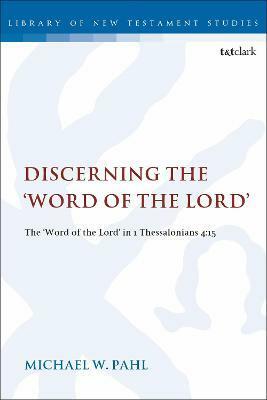 In 1 Thessalonians 4:15, the Apostle Paul appeals to a "word of the Lord" to provide authority for his eschatological encouragement. This appeal has left a perplexing problem related to the nature and function of the specific authority to which the phrase refers. Two theories have predominated in the history of interpretation: either 1) it refers to a directly received prophetic revelation, whether to Paul or to another Christian prophet; or 2) it refers to a teaching of Jesus received as tradition, whether preserved in the Gospel tradition or otherwise unknown.This book investigates this problem from three angles: epistemological analysis, examining Paul's authorities for his knowledge, particularly in his eschatology; linguistic analysis, including both grammatical and lexical study of the phrase; and contextual analysis, setting the statement within its historical and literary contexts. These approaches converge to suggest a fresh solution to the problem: while Paul does appear to employ traditional Christian eschatological teaching in his response to the Thessalonian crisis (4:16-17a), the phrase ?? ???? ?????? does not refer to this tradition, but rather refers to the proclaimed gospel message about Jesus centred on his death and resurrection which forms the theological foundation of Paul's response (cf. 4:14). Chapter One: Introduction: The Problem of the ?? ???? ?????? Chapter Two: Solutions to the Problem of the ?? ???? ?????? 2.2. The History of Interpretation of ?? ???? ?????? 5.5. An Exploration of "Word" as "Gospel"
Chapter Seven: Conclusion: A Fresh Solution to the Problem of the ?? ???? ?????? Michael W. Pahl took his Ph.D. in Theology from the University of Birmingham, U.K., and has taught New Testament studies in Canada and the U.K.